Paris Fashion Week is here and, following a dalliance with Intel and Hussein Chalayan last season, this month's event will be showcasing some of the most cutting edge fashion tech around. A special exhibition on 7 March will explore the relationship between technology, fashion and humans. The showcase has been put together by Tumblr to celebrate the release of Ghost in the Shell, inspired by the sci-fi film's futuristic aesthetics. 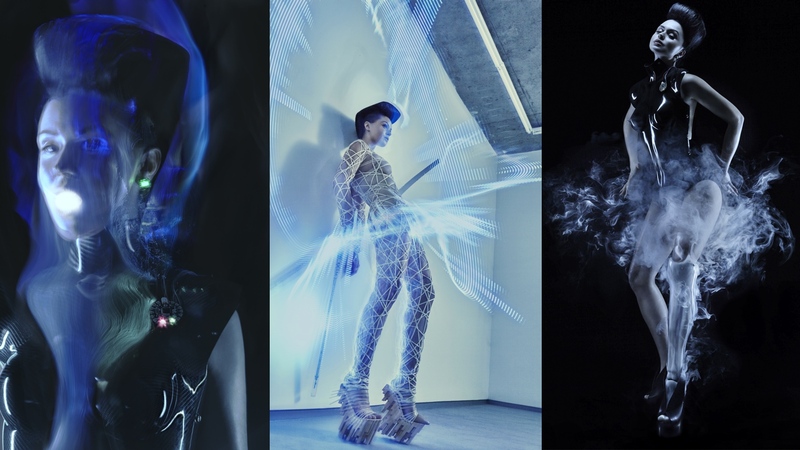 PFW guests will also be treated to a performance from 'bionic pop star' Viktoria Modesta (pictured above) who is known for wearing prosthetic legs that mix futuristic fashion with cutting edge technology. Here are some of the innovative outfits that will be on show in Paris. This bizarre garment is powered by Intel's tiny Curie computing module and was created by Hollywood costume designers Chromat. The dress (which has been shown off before) features 3D-printed panels crafted into a carbon-fibre skeleton that expands in response to how 'pumped' the wearer is, adrenaline-wise. The idea is that the wing-like structure mimics nature's fight-or-flight mode and expands to create a more imposing shape. A sensor in the waistband relays data about the wearer's breathing and adrenaline levels based on skin conductivity. More than anything, the dress is an important showcase for Intel's diminutive chipset and shows how it can be incorporated into smart clothing. One of the original pioneers of wearable fashion tech, London-based Cute Circuit is well known for its interactive designs. Celebrity fans of the maker's space-age garments include Katy Perry, and Nicole Sherzinger. The studio will be showcasing a number of dresses in Paris incorporating microLED illuminations, including the Kinetic Dress, which reacts to the wearer's surroundings. The piece is crafted from an elastic textile embedded with sensors that follow the wearer's movements. The electroluminescent embroidery changes according to the movements. Another one of the firm's show-stopping dresses is capable of receiving and displaying tweets in real time. While some of the techie fashion on show in Paris will be firmly in the conceptual camp, Emel + Aris aims to create garments that are 'beautiful as well as functional'. The firm's Smart Coat was crowdfunded on Kickstarter and features a built-in lightweight heating system that uses Far Infrared (FIR) technology. This produces heat that can be absorbed by the body, rather than heating the skin. Heat is spread over panels located on the lower back and front lower torso to keep the wearer toasty in the right places. The heat is spread through a specially formulated polymer, rather than through wiring, though a small piece of cable is used to join up to the battery. The genuinely wearable coats show how tech can be integrated in our clothing in a useful way. Though perhaps not terribly practical, this hypermodern dress from designer Ying Gao is covered in a prickly layer of dressmaker's pins. The clever design moves in response to human voice, with the pins and built-in PVDF plastic creating ripples that contract and expand the outfit. An integrated voice sensor picks up the wearer's voice and puts the dress into action. While we might not be wearing this particular garment out and about any time soon, it does show how voice recognition AI like Amazon's Alexa could be integrated into wearable garments. Design firm WiseWear's aim is to fuse technology into everyday items and it will be showcasing bracelets from its Socialite collection during Paris Fashion Week. We've seen about the range before, most notably when it was announced that the world's most fabulous OAP, fashion icon Iris Apfel, would be collaborating on the line. Dubbed 'smart jewellery that keeps you safe', the smart bracelets feature a built-in panic button. Tapping the bottom half of the bracelet will notify the wearer's emergency contact and drop a pin to mark their GPS location. The Socialite bangles also include a step tracker, notifications for calls and texts from the wearer's smartphone and are just one example of the blossoming smart jewellery sector. Footwear designer has come up with an ingenious way to use tech to make high-heeled shoes more comfortable to wear. Focussing on the link between body movement and shoe design, her 'Kinetic Traces' range makes use of tech usually limited to performance sportswear. The 3D-printed Hydraulic Heels use a clever system combining springs, rubber balls and pneumatic hydraulics in order to absorb shock. While there's no connected tech on board, the shoes illustrate how an engineering approach can be incorporated into future designs. These cotton unisex jumpers have been treated with Aerochromic dye that reacts to change in air pollution. This causes the fabric to begin to change from black to white when the Air Quality Index reaches a level of 60, completely revealing the full pattern when levels reach 160. The designs were conceived to highlight deteriorating air quality around the globe, though they could potentially prove useful for those working in environments where exposure to poor air quality could be issue. Another of the firm's designs changes pattern when the wearer enters a potentially lethal concentrated area of carbon monoxide. How do we get to mass adoption?